A look at life in Berlin when a concrete wall divided East from West. The Berlin Wall stood for nearly 30 years, dividing Germany in half, including the city of Berlin. Friendships and even families were torn apart by the line drawn between East Germany’s communist leaders and West Germany’s capitalist leaders. 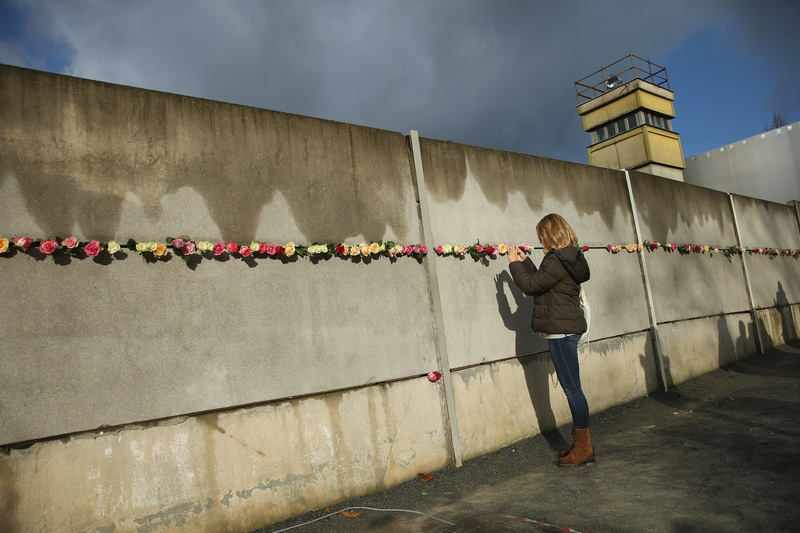 The wall was perhaps the most enduring symbol of the Cold War, and the moment in 1989 when guards opened the gates — and the German people, reunited, began tearing the wall down — became one of the most important cultural moments of the 20th century. Take a look back at the history of the Berlin Wall, the heartbreak it caused and its legacy in today’s world, in these astounding photos we’ve gathered. The city of Berlin — similar to the entire nation of Germany — was divided into a Soviet-controlled, communist sector to the east, and an Allied powers-controlled, capitalist sector to the west, in May 1945. East Germany and West Germany were officially founded in 1949. 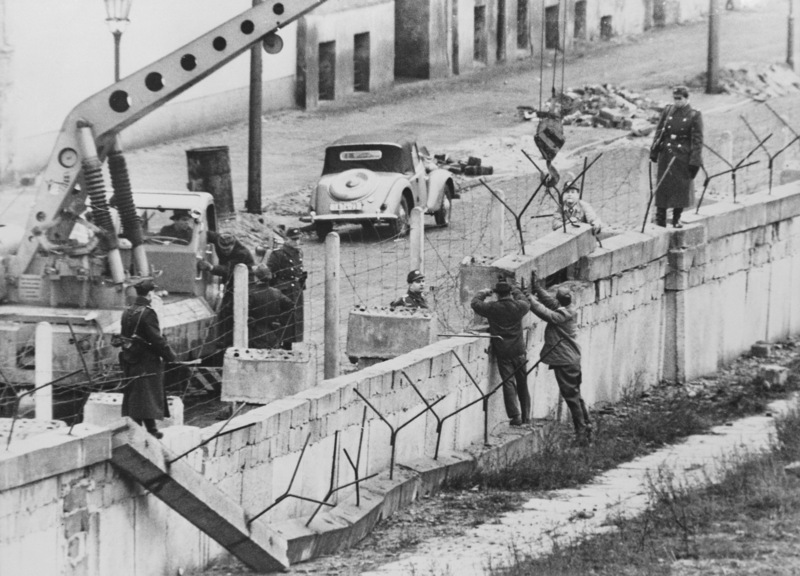 Then, in 1961, after years of seeing East German citizens leave the country for West Germany, the East Germans decided to close the border and build a wall to keep their people from leaving. Construction of the wall began on Aug. 13 of that year. 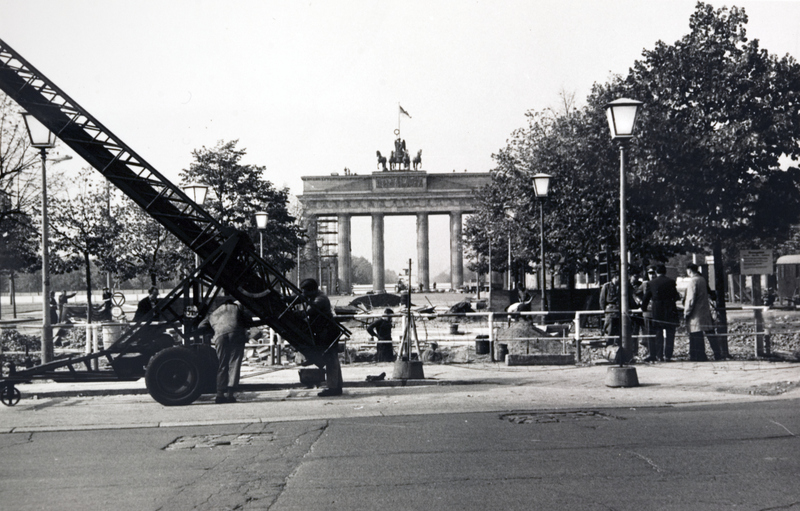 This photo, taken from the East Berlin side in August 1961, shows construction starting near the iconic Brandenburg Gate. The Berlin Wall didn’t look so imposing in its early days. At first, it was just bits of barbed wire and short stacks of stone. Here, a man looks over the wall by just barely standing on his toes, in 1961 or 1962. Eventually, the wall would reach a height of about 12 feet. In this photo, workers in East Germany build a section of the wall that has the look the Berlin Wall would become known for. Families who lived on separate sides of Berlin before 1961 were literally divided when the border was closed. A New York Times article from the first month of the wall’s existence talks about siblings who were split up, one on each side. This photo shows two little girls in West Germany talking with their grandparents, who can be seen sitting in the window of their home in East Germany, in August 1961. In the early days of the wall, East Berliners made daring escapes into West Berlin. This photo from September 1961 shows a woman being lowered from a window in East Berlin onto a street in West Berlin, as others try to help her. This photo is one of the most famous images of the Cold War. It captures the moment when an East German soldier named Conrad Schumann jumped over barbed wire to escape into West Berlin. Schumann was just 19 years old when a West German photographer snapped this shot of his defection in 1961, as the wall was being built. A statue of Schumann’s escape now stands in Berlin. The wall, like any piece of infrastructure, had to undergo repairs at times. In this photo from January 1962, East German soldiers can be seen fixing a part of it that was damaged by bad weather. In June 1963, President John F. Kennedy visited West Berlin in a historic trip that included a stop at Checkpoint Charlie, the famous crossing point at the border of East Berlin and West Berlin. In a famous speech condemning the construction of the Berlin Wall, Kennedy delivered his now-famous line, “Ich bin ein Berliner” (translation: I am a Berliner), aligning himself fully against Soviet rule of East Germany and saying all citizens of Berlin should be free. The trip came just five months before Kennedy’s assassination. The wall eventually took on the intimidating look it would have for decades to come. This photo shows people in West Berlin peeking through small holes in the concrete slats that made up the new design for the wall. Tubes at the top also replaced barbed wire, as they made it more difficult for people to climb over. East German soldiers weren’t immune to curiosity about exciting things happening on the western side of the border. In May 1965, Britain’s Queen Elizabeth and Prince Philip visited West Berlin. This photo shows two East German guards watching with binoculars as the royals toured the city. Trying to escape from East Germany often wasn’t as simple as climbing the wall — in some places, people also had to cross a “no man’s land” between two walls undetected. Along some stretches of the wall, the East Germans built a second wall and kept the heavily patrolled span between the two clear so soldiers could look for defectors’ footprints in the dirt and have a clear firing line. Here it’s shown in an archival photo. In these spaces between the two walls, also known as the “death strip,” the East Germans used floodlights, vehicle barriers and electric fencing to earn this name. In total, the border of East Germany and West Germany spanned nearly 900 miles and included self-triggering traps that would kill people trying to cross the border illegally. At least 140 people were killed by East German border guards trying to cross into West Germany during the era of the wall, according to the Berlin Wall Memorial. West German citizens were able to get a visa that allowed them to visit East Berlin. Here, a long line of people in West Berlin wait to have their visas approved. People in West Berlin obviously had much more freedom than their eastern counterparts. 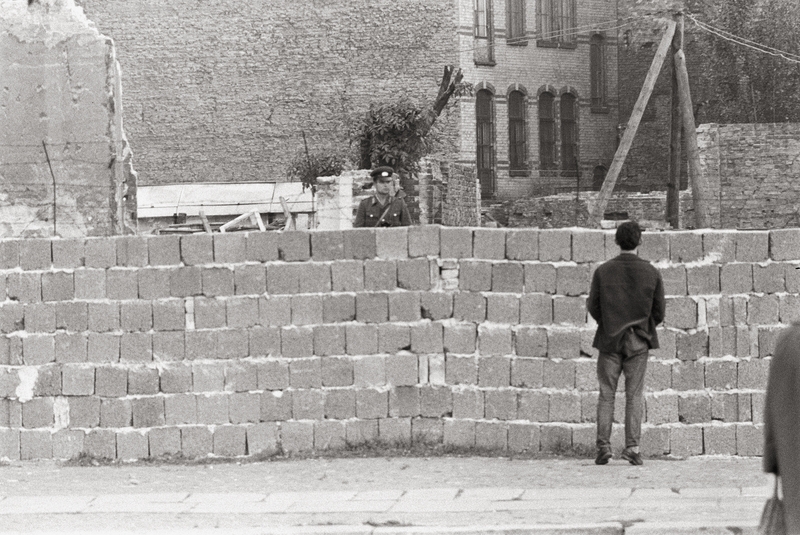 In this photo, a couple of West Berlin residents stand atop the wall to talk with relatives who lived in East Berlin. During the divide, the East German secret police made the lives of the country’s citizens a paranoid nightmare. Today, one of the bunkers used by the secret police operates as a museum that allows visitors to stay overnight and dress as East German soldiers to make the experience more realistic. Guests also have to eat like the soldiers, preparing their own meals in the bunker’s kitchen. For decades, the secret police spied on the East German people, keeping files on them. Today, the Stasi archive, which includes data that was gathered by the East German government on its own citizens, allows anyone who was spied on to view their own file. The archive includes miles of files and hundreds of thousands of photos. In 2007, a document from 1973 was discovered that revealed East Germany had an official policy allowing Berlin Wall guards to shoot and kill anyone — including kids — who were seen trying to flee into West Germany. The East German government had denied that such a policy existed before the proof was found. Below, members of the East German border guard check an old man’s papers in 1961. Eventually, the people of West Berlin showed their disgust with the wall by covering it in graffiti. A section like this, shown in 1989, is how many people likely imagine the wall today. On the east side, the wall was free of vandalism. On June 12, 1987, President Ronald Reagan gave a famous speech in Berlin, saying to Soviet leader Mikhail Gorbachev, “Tear down this wall.” In 1990, Gorbachev would be given the Nobel Peace Prize for his work in easing Cold War tensions and helping end the division of Germany. In July 1988, Bruce Springsteen played a historic concert in East Berlin that only ended up inspiring more of the people who lived there to push harder for freedom. A little more than a year after Springsteen’s concert, which also aired on East German television, the Berlin Wall would begin being dismantled. In October 1989, as many as 70,000 protesters stormed the streets of Leipzig, southwest of Berlin, demanding a revolution and an end to the division of their country. These peaceful demonstrations were a huge signal that the fear that had ruled over communist Germany was on its last legs. The protests preceded the fall of the Berlin Wall by just a month. On Nov. 9, 1989, East German border guards allowed people to pass through into West Germany without objection. But the opening of checkpoints on that date was a mistake — a Communist Party official misspoke about a change in visa restrictions, and what he said led people to believe they were free to cross the border immediately. When guards finally opened the gates for the masses of people gathering, Germans from both sides were soon roaming freely for the first time in 28 years. East Germans born after 1961 had never set foot in the western portion of their country. But after the border was opened, that changed. In this photo from 1989, some East Germans can be seen entering West Germany for the first time. Germans celebrated New Year’s Eve 1989 in an epic way, sitting on portions of the wall just months after it had been dismantled. That night, David Hasselhoff, who had legions of fans in Germany, performed his song “Looking for Freedom” to a delighted crowd. The song was a hit for Hasselhoff in West Germany and had come to represent the country’s desire for unification. The fall of the Berlin Wall ended up being terrible for rabbits. The so-called no-man’s land became a thriving habitat for rabbits during the Cold War, and when the border was opened, the bunny population ran away, terrified, because of the sudden rush of human foot traffic that hadn’t existed there before. A 2009 documentary called “Rabbit a la Berlin” told the tragic story of these animals that were displaced by newfound human freedom. Every year since 1990, German Unity Day is celebrated by people across that country on Oct. 3. The date commemorates when the reunification of East Germany and West Germany was formally completed. As you can see in this photo, it’s a major holiday. In 2004, a privately funded memorial to people killed by East German border guards during the Cold War was built near a section of the wall. The memorial featured 1,056 stark crosses, each commemorating a victim. The German government eventually tore down the memorial, stating it was illegal. Today, portraits of the people who were killed trying to cross into West Berlin still stand at sections of where the Berlin Wall once stood. These memorials are a common gathering point for tourists. In April 2016, the Wall Museum opened in Berlin. In 2009, Germany celebrated 20 years since the wall had fallen by toppling more than 1,000 giant, styrofoam dominoes painted to look like sections of the Berlin Wall. The dominoes spanned a trail about a mile long. In 2014, the country marked the 25th anniversary of the wall’s fall by illuminating 6,800 lamps along a 9-mile trail. In February 2018, the Berlin Wall had officially been down for as long as it stood (10,316 days). A previously hidden section of the wall was found in June 2018 by a tour group, showing this relic of German history still has some things to show us.